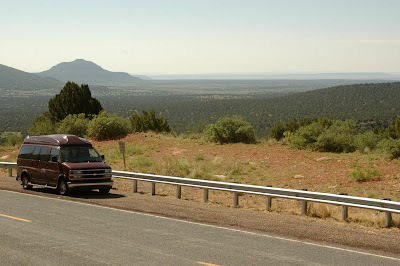 While in a parking lot of a grocery store in Ely, Nev., almost two years ago, a local resident walked by while we were loading groceries into our long-wheeled base, high-rise Chevy van. She didn't stop to talk. All I heard her say was (in referring to our van): "That's the only way to go." Of course, for the past 40 something years, a van, for us, has (almost) been the only way to go. The maroon van we had on that trip is still with us. At 11 years old, it is still running good. And I would make that 6,000-plus mile trip again at the drop of a hat. On our recent skiing trip to Boone, NC, the odometer hit the 200,000-mile mark while we were going through Atlanta. This wasn't the first van we owned that hit that mark. We purchased a 1985 GMC van in early 1986. 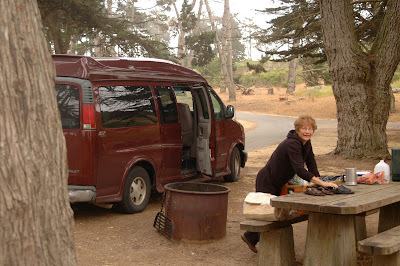 We kept that van for 22 years and traveled far and wide with it, although it never made it into California. Las Vegas was the farthest. Our first van was a 1971 long-wheel base Chevy. Our first jaunt in it (1973) was a three-week excursion covering some 7,000 miles that took us as far west as Spokane, WA and then down into California and back. A few years later, in 1977, we took a year off to travel around the US. Our five-year-old was with us and upon leaving our home in Ocean Springs, that vehicle took us all the way up to Canada and over to Maine and then back home for a short stay. Then it was three months out west traveling along the southern border and into California and all the way to San Francisco. The third part of that trip took us to the Badlands in the middle of the summer. We went insane shortly after returning, thinking we needed a four-cylinder vehicle to help save on fuel costs. It wasn't the same. We added a Chevy Astro van to compliment the other vehicle and eventually got rid of both. And old blue Chevy was another addition in which we traveled a lot. A trip to California had us stopping too often to check the oil and refill. Vans are so convenient. In the early days (before all the safety regulations) our kids played in the back of them while we were headed down the road. They have a lot of space, and upon building a bed in them and adding a porta-potti and Coleman stove, they become recreational vehicles. Vans provide good cover when sleeping somewhere out on the road, and cooking in them and picnicking can't be beat. OK! Yes, they are more expensive when it comes to fuel. Our current vehicle is an 8-cylinder. The previous one was too. But, hey, when you can sometimes sleep in inexpensive or fee locations (like Walmart), it works out to be a good deal. I cried when we got rid of our first van which was like a family member, having been with us for two trips of a lifetime all over the United States. I've matured since then, but I still have strong feelings for vehicles that have served us well. And our vans have done just that. All I have say about when it is time to travel is a trite play on words about our vehicles and a noted artist -- "Van-go."